Noun & adjective. Also obsolete cometa. Lower Old English. The root meaning behind the word comet is literally 'long-haired star' which, aside from being a pleasing etymology, is useful if you're ever trying to remember the difference between a comet and an asteroid. At its simplest level, the difference is in their composition - asteroids are made of rock and metals, while comets are made primarily of ice, though usually with some rock, dust, metal and other debris thrown in for good measure. It's the defining ingredient of ice that helps us, though - as comets approach the vicinity of the Sun, some of this ice begins to vaporise, forming a hazy coma around the nucleus of the comet. 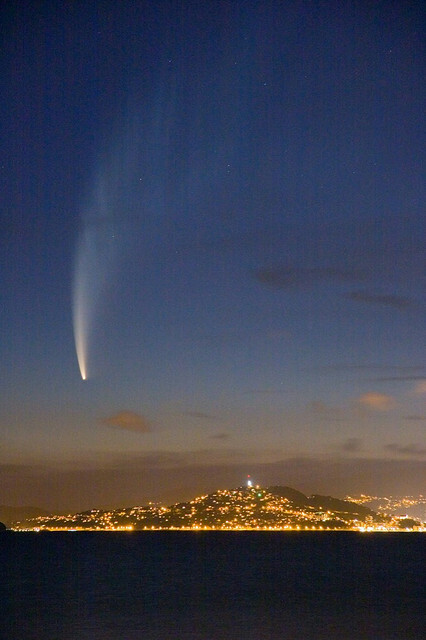 What's more, some of this coma is blown away from the comet by solar radiation, giving it its tell-tale tail which seemingly reminded some ancient Greek astronomer of long, flowing hair. Asteroids, being rock and much more inert than the grandiloquent comets, have no such material to develop a coma, and therefore remain tailless. Just one another cometical fact - they tend to have significantly more elliptical orbits than their rocky asteroidal cousins. If they didn't and orbited the Sun more frequently, it's likely that in the intervening billions of years between when they first dropped into the Solar System and we first cast our eyes skyward to observe them, they would have long ago shed all of their ostentatious tail-making ice. However, because they pass the Sun so infrequently, they've retained enough material to still put on this display. As such, comets are spectacular relics of this ancient universe - sailing through the Solar System on staggeringly vast orbits of over 50,000 AUs, having changed little since their birth perhaps 4.5 billion years ago. Do please leave your most heavenly comments in the comet box below. Welsh comets are a 'tail-star' - 'seren gynffon' also 'seren gynffonnog' (tailed star) but they're also called 'comed' as well. In English an obsolete term for a 'comet' which preserved the notion of 'hair' was 'faxed star' from Old English 'feaxed steorra' - feaxed, ġefeaxed (“haired, having hair”) from feax (“hair”) and 'steorra' (star). Modern Greek for 'comet' (κομήτης - komí̱ti̱s) is still the same as its Ancient Greek (ἀστὴρ) κομήτης - astér komí̱ti̱s - 'long-haired' (star). I wonder what descriptive names non-European languages have given comets. The only languages I have any familiarity with are Romance ones, so that doesn't really help. I'm only familiar with the non-European languages in varying degrees on our own doorstep, so to speak, such as Hungarian and Turkish. The operative element of the Hungarian word to describe a comet is üstök which can mean a forelock, tuft of hair or crest and when coupled with a suffix means 'comet' (üstök + ös). Turkish comets like Welsh have a tail (kuyruklu yıldız - 'star having/with a tail) but Mandarin Chinese is a little more enigmatic with 彗星 (huìxīng) the first ideograph representing 'broomstick' maybe expressing a notion of sweeping?